The Telephone Box in Ley Orchard has been discontinued and was removed on March 29th 2018 on way to its new location. Willersey has decided to adopt the telephone box (for a pound) for other uses. Please do send your ideas for its future use to the Parish Council. Here are some ideas from the UK and other countries:- One two and three. Cotswold District Council has issued its draft decision. This was subject to consultation until 12 Noon on 23rd December 2016. Under the rules established by Ofcom, the council is obliged to publish a draft decision, and consult locally and with BT for one month, prior to the publication of our final decision, in time for British Telecom's deadline of 5th January 2017. Overall, the draft objects to the removal of 19 public call boxes, and supports the proposed adoption of five others. Objections are proposed where we have received justified objections from parish or town councils, or where other factors justify the retention (factors such as the level of usage, mobile phone coverage, accident hotspot). We do not believe we are in a position to object to the other boxes subject to this consultation, based on the evidence we have. 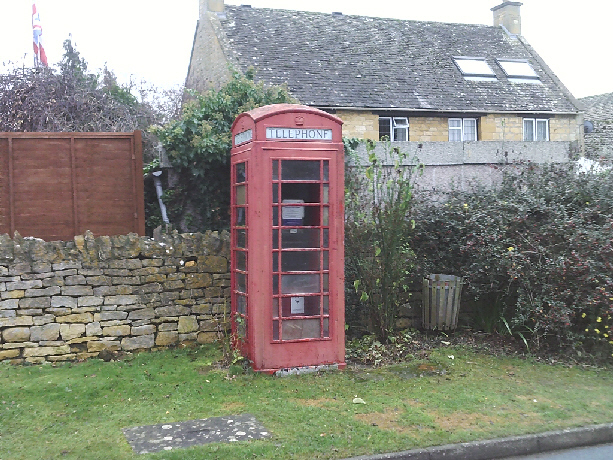 CDC has supported adoption of five phone boxes, where the community has expressed this wish, and there are limited grounds to support the retention of the telephony (for clarity, when a box is adopted, the telephony is removed, and the community takes on the ownership of the call box to use as it sees fit. While telephony is lost, the telephone box is preserved in situ, retaining its aesthetic value, and often being repurposed for community benefit. This option will no longer be possible after the close of BT's consultation on 5th January. Further comments were made to joseph.walker@cotswold.gov.uk, by 12:00 Noon on 23rd December 2016.